Pangea Gecko Diet: Diets for New Caledonian, Day Geckos and more! 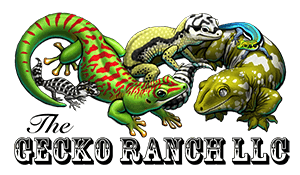 Gecko Ranch is proud to be an Authorized Pangea Dealer. HOW TO ORDER: One Crested Gecko will eat approximately 4.0 oz of Pangea Diet each month. Lasts six months after opened when kept in the fridge. Geckos besides New Caledonian and Day Geckos known to eat the Pangea Diet: Bavayia, Eurydactylodes, Hemidactylus Homopholis, Geckolepis, Gehyra, Flying Geckos, Tokays (some, not all! ), White-Lined Geckos, Pareodura gracilis. My Blue-Tongued skinks also enjoy it! Our new gecko diet formula with the delicious taste of Organic Fig and insects. This Banana free formula has a strong Fig smell and flavor to entice your picky geckos to really chow down. The absence of bananas is perfect for geckos that don't seem to really like banana flavor foods. By using other base fruits we were able to incorporate fig into the diet while still maintaining very low levels of Oxalic acid. We have incorporated crickets and black soldier fly larvae as the main source of protein as well as organically grown mealworms to increase the Omega fatty acid content. This formula has twice the amount of insects as our original "With Insects" formula. Pangea Fig & Insects mixes up a bit thinner than other formulas due to not having the banana as an ingredient, but the geckos seem to like this thinner mix. It can be more difficult to see lick marks so we recommend offering smaller amounts to begin with so you can see it disappear. 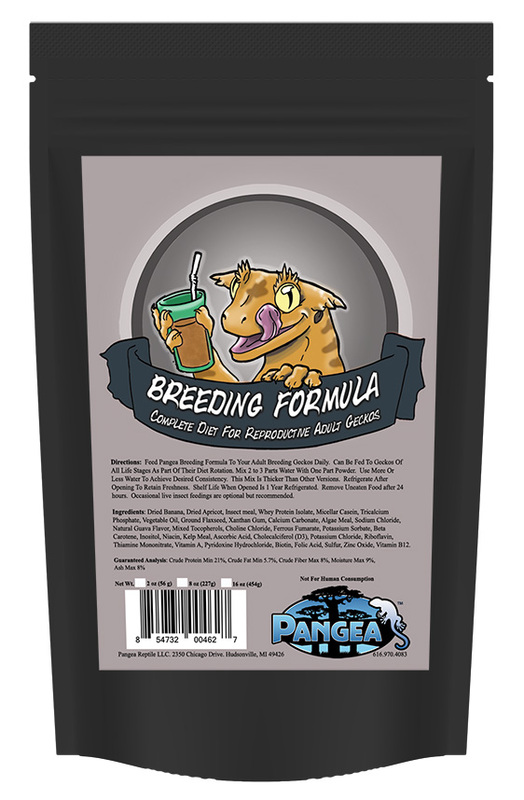 Pangea will offer this formula for a few months and decide based on customer and seller feedback whether or not to make it a permanent addition to our gecko food lineup. 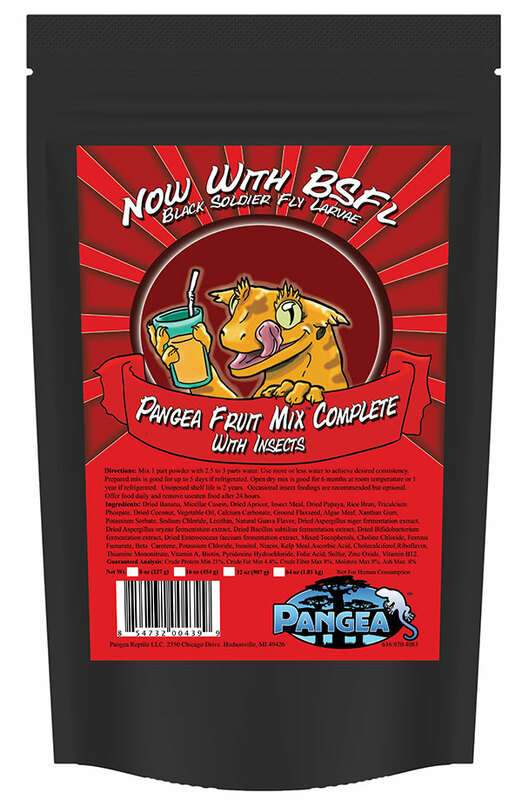 Pangea Fruit Mix With Insects, the newest addition to our line up of complete gecko diets. We set out to create a gecko diet that incorporates insects as one of the main ingredients and generates an enthusiastic feeding response. Life Stages: Growth (fed daily or alternated with live food) Maintenance (fed 3-5 times per week) Breeding (fed daily or alternated with live food). We are excited to announce the release of our new Complete Diet for crested geckos, gargoyle geckos, leachianus, chahoua, day geckos, and all other fruit eating geckos. Using what we learned while formulating the original PFM™ starting back in 2008, and working off of that platform, we have come up with a diet that is both palatable and complete. 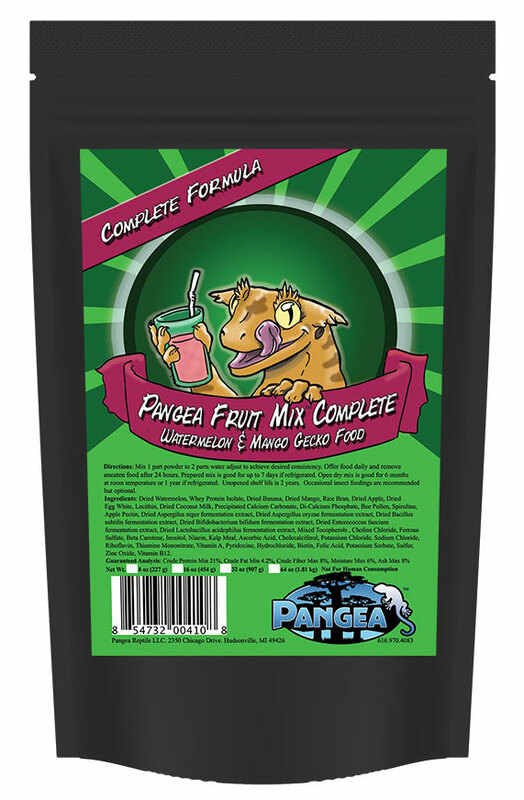 The Pangea Fruit Mix™ Complete formula was developed and tested here at Pangea on one of the largest collections of geckos in the United States. We then hired a PhD in animal nutrition to make sure we got it right. Life Stages: Growth (feed daily or alternated with live food) Maintenance (fed 3-5 times per week) Breeding (feed daily or alternate with live food). 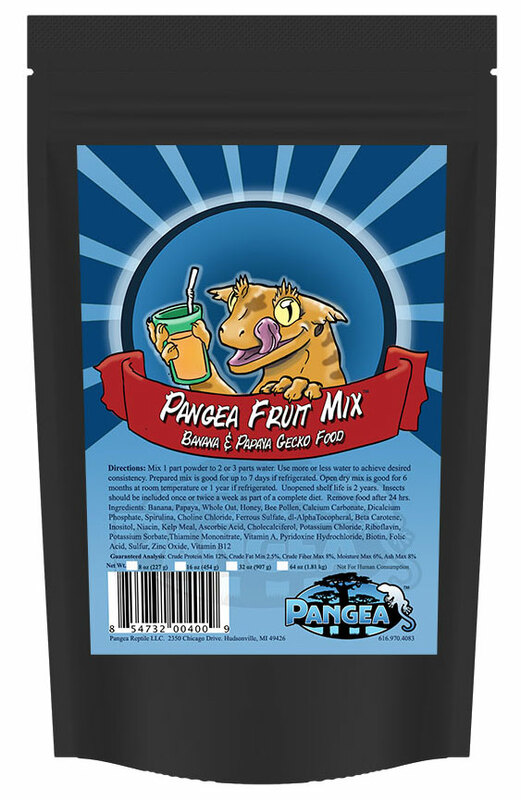 This Pangea gecko food is formulated to have higher fat and protein content that other versions of PFM while still being extremely palatable to your geckos. The Apricot gecko diet incorporates three complete animal based protein sources. Life Stages: Growth (feed daily or alternate with live food) Maintenance (fed 3-5 times per week) Breeding (feed daily or alternate with live food). This formula is very similar to the Watermelon-Mango formula nutritionally speaking but with a higher fat content and a different flavor profile. This formula is a favorite among our crested geckos in and is devoured readily by all of our geckos. Can be alternated with the PFM™ Watermelon Mango or fed exclusively. Life Stages: Growth (feed daily or alternate with live food) Maintenance (fed 3-5 times per week) Breeding (feed daily or alternate with live food). 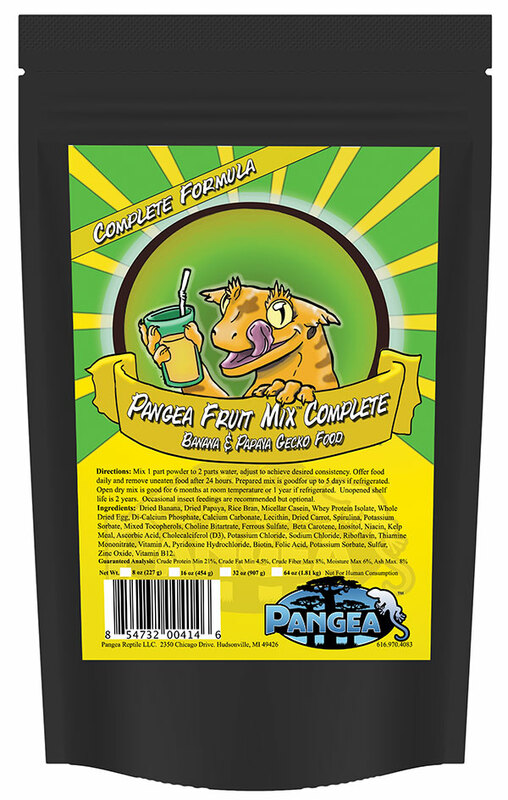 Pangea Fruit Mix Gecko Treat is a low protein version of our complete diets. It can be fed as the fruit portion of your geckos diet along with at least one or two insect feedings per week or as a mix in to get picky geckos to eat the complete diets. 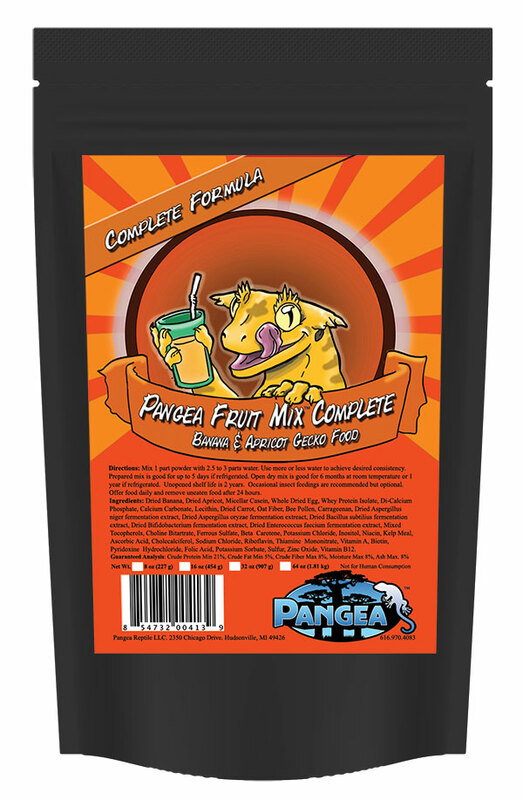 Each 8 oz bag of Pangea Fruit Mix™ makes an entire blender full of food! Pangea Gecko Diet Breeding Formula was is ideally suited as a breeder formula but can be fed to geckos of all life stages. It is showing a lot of promise as a growth formula however it was developed and tested with breeders so it will take more time before we can conclusively make that claim. Life Stages: Breeding (feed at least 4-5 days per week).